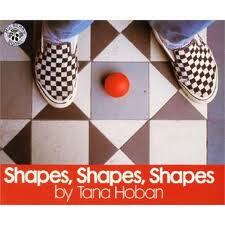 These are books that you can read to your class that will help to reinforce their learning of geometric shapes. There are so many great books out there! The books that I have chosen go along with my suggested lessons/activities to teach the Geometry strand to your kindergarteners. *All of these books can be found on Amazon.com. If you click on the image of the book you will be connected directly to the book's information and ordering page. A Circle Here, A Square There. By David Diehl. Illus. by author. 2007. 22p. Lark Books, (978-160051167). Preschool and up. This is a board book (other styles are available) that introduces shapes in a colorful and engaging way. The shapes are shown in everyday objects that children will be able to relate to easily. Shapes, Shapes, Shapes. By Tana Hoban. Illus. by author. 1996. 32p. Greenwillow Books, (978-0688147402). Gr. preschool-K. This book teaches children to look at shapes in their environment and identify them with their geometric names. Shapes beyond circles, squares, triangles, and rectangles are included in this book (hearts and stars). This is a effective introductory book to get students observing shapes in their own environment. Color Zoo. by Lois Ehlert. Illus. by author. 1989. 40p. Harper Collins, (978-0397322596). Gr. preschool and up. This book reveals shapes to children in a unique way. Each page is a different, colorful animal face made of circles, squares and other shapes. Students will have fun discovering the shapes that they are learning about in each illustration.